London, Asharq Al-Awsat—As the US continues its military efforts against the Islamic State of Iraq and Syria (ISIS) in both countries, the world’s attention has drifted away from efforts to find a negotiated end to the ongoing crisis in Syria. Nonetheless, efforts continue by figures like the UN’s envoy to Syria, Staffan de Mistura, to find a political solution, which also remains the stated goal of the US and other members of the group of states which calls itself the ‘Friends of Syria.’ Asharq Al-Awsat spoke to the US’s special envoy for Syria, State Department diplomat Daniel Rubinstein, on the fringes of the group’s latest meeting in London on Monday. 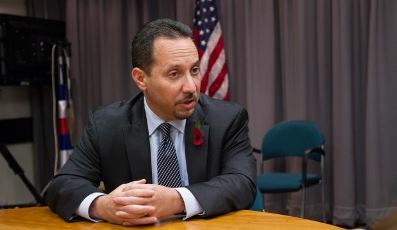 Rubinstein, who became the special envoy to Syria in March after serving in a variety of posts in Washington and the Middle East, told Asharq Al-Awsat that the US was opposed to the partition of Syria, and reiterated Washington’s support for a political solution to the conflict, denying that its efforts to defeat ISIS were undermining its efforts in this regard. Asharq Al-Awsat: There has been talk lately of “freezing” the conflict in Syria with local ceasefires. The UN envoy Staffan de Mistura has proposed a local ceasefire around Aleppo, which Bashar Al-Assad has said he will consider. Do you think this is a viable plan? Daniel Rubinstein: Well, first I would say that we know Staffan de Mistura very well from his previous experience as a special envoy in Afghanistan, Iraq, and Lebanon, so I think we have a high degree of confidence in him and I think he has established a very good track record in the international community. Secondly, I’m a little bit reluctant to comment on President Assad’s reactions because I haven’t seen those particular remarks. What I would say is that we did have some very good meetings with Staffan de Mistura when he was in Washington. He has injected a new energy into this very sad, serious situation, and he is looking for potential openings. He has shared, in general terms, his idea for “freezing” the conflict in terms of the physical position of the forces on the ground with a particular emphasis on Aleppo right now. I think it might be a little bit premature to [speculate] what the details that he has in mind are, or that potentially could be agreed upon by the different parties, but what I would say in general is that . . . we want to make sure that it’s the moderate opposition that at the end of the day will be able to judge what makes sense in terms of any particular change, whether it’s a freeze or anything else. Unfortunately, there’s the negative experience in the past with some of the ceasefires, which were, frankly, exploited by the regime in very, very, negative ways, and I think Mr. de Mistura is very aware of that , so we are going to be looking to the details, and more importantly, to how the moderate Syrian opposition reacts to any particular proposal. Q: The people on the ground in Aleppo are not all members of the moderate Syrian opposition. How confident are you in the moderate Syrian opposition’s ability to actually cut a deal and enforce it on the ground? Well, I think in the first instance you might want to ask Mr. de Mistura what he has in mind in terms of particular implementation or monitoring mechanisms, since under the current concept it would be the UN that would have that central role in weaving something together. As far as the moderate Syrian opposition [goes], it is true that there is a broad spectrum of players. I would agree with you that there is also a multiplicity of players on the side of the regime, whether it’s in terms of armed militias, Syrian or foreign, so I think that is something that bears a lot of attention. I think, though, that if and when there is a serious process, whether it’s a local process of potential physical changes on the ground or even a political process of negotiation, we saw in Geneva that the moderate Syrian opposition did come together, and in fact performed admirably, and did show some cohesion. So I personally am confident that they will be able to do so, if in fact there is a proposal which they viewed as being one which lessens the suffering of the Syrian people, and, secondly, something that the opposition find to be advantageous to them. Q: From what you are saying, it seems that there are still details in de Mistura’s proposal that need to be worked out. Well, I think that given that he is still actually talking with the Syrian regime about it, I would say that definitely it is [still] nascent, and I am not aware that he has as yet engaged the Syrian opposition actors on it as well. So, maybe just in general terms, but [when] the rubber hits the road, when in fact he has specific details about a particular set of circumstances in a particular physical location . . . then [he will] determine what he is able to extract from the different parties. But, certainly, we sense that he is bringing some energy to the situation, and I think that he is motivated by the imperative to do anything that would reduce the suffering and the violence, and in some way or shape or form get some kind of process going. Q: The US has repeatedly said that it believes in a political solution for Syria. Given the realities on the ground now, and given the presence of ISIS, what is that political solution? Is it just based on the principles of Geneva I? Well, certainly, the principles that are encapsulated in Geneva I are extremely important and they remain valid today. Now, it could be that either through the efforts of Mr. de Mistura or others in the region or beyond that other things are added to the mix, whether in terms of choreography, or formulation, or sequencing, or what have you, but the principles, in particular the focus on the need for a political transition in Syria away from the Assad regime, I think remain quite central. And I would just point to the fact that the ‘London 11’ core group of the Friends of the Syrian People just met today in London as a useful reminder to the international community, and more particularly to the Syrian people, and to the Syrian regime and its backers, that in fact the international community has not lost focus on this issue, and while we are very focused on [ISIS] as you noted, that has not in any way detracted from the commitment on the part of the international community or those who are worried about Syria to see what can be done using the various levers of influence and pressure and assistance vis-à-vis the opposition, the regime and others in the international community to try and get those circumstances to emerge that would increase the chances for a political solution. Q: Does a “political solution” still mean that Assad would have to step down from the presidency? Well, we have been very clear. The president of the United States said that he [Assad] has lost his legitimacy. We have said that we will not, and we are not cooperating with that regime, and we do not see his remaining in power to be consistent with any kind of sustainable political solution. Q: In the early stages of the conflict in Syria there were some signs of possible defections from within the regime. Is that dynamic still there, or is the regime more cohesive now? What I would say is that we are always interested in making sure that we have our eyes and our ears open to the entire Syrian people, and in particular those inside Syria. Of course we try our best to maintain the contacts that we have with all parts of Syrian society of all political leanings, wherever they are socioeconomically or in their ideology. I think it’s extremely important that we continue to do so, so that in fact we will have as good an understanding as possible of what’s happening there. Now, I am not able to say that there has been an increase or decrease in a particular phenomenon like defections. What I do say is that there are a lot of people who are very astute observers of the Syrian situation who are identifying certain weaknesses—certain strains in the regime—because of how long this conflict has gone on, and, particularly, certain key constituencies of the Syrian regime have been paying a very high price for the brutal policies of Mr. Assad, so that is something that I think we need to keep a close eye on. Q: There are concerns that US policy towards the conflict in Syria has become one that is exclusively focused on counterterrorism. President Obama has said that in the long term a political solution for Syria was needed, but the immediate concern is to deal with any possible threats to the US. So has it become a counterterrorism strategy, at least in the short term? Counterterrorism is an imitative of the United States, and of our allies as well, and that is kind of a 24/7 job. That’s a priority throughout the world. It happens to be a higher priority in the Middle East for obvious reasons, and particularly in Syria, and we have had to take some very decisive actions, because of our counterterrorism concerns. That is not inconsistent with, and does not contradict, our other goals in this region. And that of course gets us back to the need to try to use the leverage that we have, in combination with our allies, to try to get a political solution. I don’t view that as a contradiction. Sometimes there may be an immediate imperative to take action because of certain counterterrorism reasons, but there is a clear understanding that we will not get to a sustainable situation, whether in terms of degrading and ultimately defeating [ISIS], or in terms of a stable Syria that is at peace with its neighbors and gives the citizens of Syria the freedom and dignity they deserve, unless there is in fact that political solution. Q: The political solution is seen differently by key players, especially when we look at Iran, and so there are many questions as to what is going on between the US and Iran. Regarding Syria, has there been any opening up of discussing Syria with Iran at the moment, especially when it comes to not only fighting ISIS but also trying to come to a political solution? It’s my sense that our conversations and discussions with Iran have been focused on the nuclear issue . . . I think we would be happy and surprised if we saw Iran taking a different tack and taking a different approach throughout the region, whether in Syria or beyond. Unfortunately, there’s no hiding the fact that Iran has chosen to be a very robust supporter of the Assad regime in many different ways, and this has been highly detrimental to the emergence of a political solution. But as of now I know that our dialogue with them has been on the nuclear issue. Q: Iran wasn’t involved in the Geneva talks directly, but there has been some sense from US official statements that this would be welcome if the Iranians changed strategy in Syria. Well, in the past I think they had the opportunity, like the other countries who attended [the Geneva II peace conference] to accept the basic premise of that particular international engagement. They chose not to do that, and that was their choice [to make]. I think that should they decide that they want to become involved in some kind of process that will lead to a significant transition, a pathway to transition, in Syria, I think they will find many in the region and in the West to be quite open to that. But in the first instance, they are going to have to decide whether they want to continue on their current path, which [constitutes], unfortunately, very, very robust support for the Assad regime, and that has allowed that regime to continue in its very brutal approach . . . and refusing in fact to engage in any kind of lessening of the violence, let alone a political solution. So I think we will have to wait and see if they are interested in doing so. Q: The US worked with Russia to craft an agreement to dispose of Syria’s chemical weapons. Do you still coordinate with Russia, despite developments in Ukraine? The Russians hosted quite a significant meeting in Moscow with members of the Syrian opposition recently. Did they coordinate that with you, and do you think that is a possible way forward? You were correct in mentioning that we have worked with Russia on Syria, and sometimes with significantly positive results. They are an important potential player on Syria, and Syria remains an important subject that is discussed from time to time between the United States and Russia . . . Unfortunately, Russia has also chosen to continue its robust support for the Assad regime, but I think there is a clear understanding on our side that Russia could have potentially a very significant role to play. I would agree with your characterization of the meeting the other day. I think that you are referring to Russia hosting Moaz Al-Khatib, who is a very prominent figure, and that is something that we will continue to watch, particularly if Russia takes, or does the kinds of things that show that it is in fact open to broad spheres of the Syrian opposition and is in fact looking again to participate and bring its influence to bear for some type of political transition. We haven’t seen those signs yet, but we would be very interested in seeing them. Q: The head of the Syrian National Coalition, Hadi Al-Bahra, attended the Friends of Syria meeting in London on Monday. The Coalition is under huge pressure to show that it is still relevant. How can the moderate opposition maintain its presence while it faces militants from ISIS and the Al-Nusra Front? What I would say is that the Syrian opposition in general has faced great, great challenges in this period. They are dealing with a massive humanitarian disaster unprecedented in the current period, during a period in which there is great fatigue, I think, among the international community over Syria and other crises. Of course, they were already dealing with the brutal Assad regime, then the emergence of [ISIS] and, of course, now even the very unfortunate negative actions of the Al-Nusra Front, event against elements of the Syrian opposition itself. They are also trying, with their modest resources . . . to bring services and relief to the Syrian people living in liberated areas through the actions of the interim government and local councils, so they have a very, very, very steep set of challenges, and obviously we are very sympathetic, we tried to bring to the parts of the Syrian opposition the resources that we can, and moral support of course, and we are going to continue to do that. And I think that they are also going through their own set of political processes, and they represent a very diverse [cross-section] of society, as you know. So trying to keep a very broad, diverse coalition together is itself a challenge, and they are spending some time on that as well. Q: You mentioned the Al-Nusra Front. There are some opposition voices that are concerned about the US airstrikes against the group. Unfortunately, there are elements of Al-Qaeda that have chosen to take refuge in Syria, and just like in the first night of military operations of the coalition, there were . . . unilateral actions by the United States to prevent those elements, who had become quite advanced in their planning [to attack us]. Obviously, Syrians on the ground are interpreting this in different ways . . . and its clear that for us, Al-Nusra is not part of the moderate Syrian opposition, though we recognize that our actions, and those of the coalition, can have second and third-order effects. But I just want to be clear that those actions . . . were in fact targeting senior Al-Qaeda elements who had taken refuge in Syria to pursue planning for attacks against Western interests. Q: There are worries that the airstrikes against ISIS, Al-Nusra, and Al-Qaeda are strengthening Assad, which makes a political solution more distant. At the same time, US officials have said publically that the training being provided to the Free Syrian Army (FSA) is intended to help them fight ISIS and Al-Nusra, and not liberate Damascus, so-to-speak. How do you respond to those FSA elements that say that they are being sold out? I think you were referring to the planned “train and equip” program of the United States, which we recognize, of course, [that] while we are focused on strengthening those forces which could fight against [ISIS] . . . those who are fighting in the moderate Syrian opposition face many enemies and many challenges on any given day depending on where they are and what’s happening; and, of course, this conflict has been very fluid. Some of them may have [ISIS] as their immediate threat which they need to meet; some of them have Al-Nusra; some of them may have the Syrian regime—sometimes more than one of those . . . So, we do recognize that people are very stretched in terms of their resources and their ability to face all of these threats, and we also recognize that in fact it is imperative, if we are to keep the faith of the Syrian people, that we do as much as we can to help them in their struggle for freedom and dignity vis-à-vis the regime. Q: So, just to be clear, with the train and equip program, is the goal to train forces to expel ISIS from the areas that are under their control and to hold that ground, or are they also going to be fighting Assad’s forces? Again, it will depend when this program is actually implemented and what the situation on the ground is. But, certainly, the intent is that these forces are able to secure areas, and hopefully we will have situations in which we have successfully expelled ISIS from different parts of Syria; and we would hope that these forces would be able to provide local security, [and] at some point perhaps go on the offensive, but we also recognize that these forces . . . will be in situations where they are facing the regime or other extremists, so as much as we would like to be clinical in separating these things, we recognize that the Syrian battlefield in fact is one which is very messy—but that the only true partners that we have are the moderate Syrian opposition. Q: There are some people who envision a Syria where ISIS has been expelled from certain areas which are held by the moderate Syrian opposition, and then you have Assad controlling Damascus and Homs and other parts of the country in a stalemate until there is a political solution based on this division. Would that be an acceptable short-term goal? Well, I would take that opportunity to say that in fact we believe in the unity of Syria, and I do hear from time to time that there are people who think that there are plots or conspiracies to partition Syria, and sometimes even ascribe that to the United States. That is in no way or shape of form our desire. We believe in the unity of Syria, now and in the future. We also are going to do whatever we can to prevent further fragmentation [such] as you described. We are very interested in doing what we can to degrade and defeat [ISIS] in Syria, to strengthen the opposition, to create those conditions for a political solution, which has to be a political solution for the whole country. Q: But in the short term, given the realities in the country, it’s hard to see Syria being one coherent country under one rule. So what happens in the medium term? Well, of course it’s going to have to be Syrians who decide what’s safe enough for them, and what choices they are going to have to make at the end of the day, not for external parties—not for the United States, not for regional players, not for Russia. 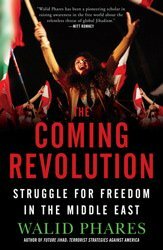 It’s going to have to be the Syrian people themselves who define the contours of what is acceptable in terms of political change in that country. Of course, we recognize that we cannot achieve all of our goals, or the goals of our friends in the moderate Syrian opposition, in one day. These challenges are very, very steep indeed. However, we have to start somewhere, and we want to make sure that in fact we don’t precipitate further fragmentation of Syria. That is already a serious enough problem, and we want to make sure that whatever solutions emerge are ones that work for all Syrians. Q: There have been different questions raised about the role of Turkey, not only in the coalition against ISIS, but also in their allowing foreign fighters to go across their border . . . I think it is better to have our Turkish friends and allies describe the current situation on their borders. What I would tell you again is that they are a friend and a key ally of the United States. We have very good, intensive consultations with them, really, on those issues and others. Obviously Syria is a very, very important issue for them as it is for us. We work in very close partnership on all aspects of Syria, Iraq, the fight against [ISIS], and other regional challenges, and we are going to continue to do so. We are going to continue to see how we can work together so that our common efforts on things like stopping the flow of foreign fighters—which is a danger to Turkey, to Syria, to Iraq, to us—or other lines of effort, such as trying to prevent [ISIS] and the Syrian regime from having sources of economic strength. Q: How do you respond to claims that the US’s policy on Syria has damaged its credibility? I will let the historians give us a grade on our credibility during this time. Obviously our challenges are very significant. If they were easier they would have been solved a while ago. We have very vital interests in that part of the world and probably no single issue has been discussed and debated as much in Washington DC in the last few years as Syria, so there is great focus on it. The choices have unfortunately become increasingly difficult, but we are going to continue to do what we can to advance our interests and those of our allies, including the moderate Syrian opposition. Q: Do you envisage the restarting of negotiations that took place in Geneva as the way to break through the stalemate? I think it is too early to tell, frankly. We don’t know, if and when a political solution or process is revived, if it’s going to look like the previous format—whether it will involve those countries, whether it will involve other countries. What I do know is we will be interested in the content, and we will be looking to our friends in the Syrian moderate opposition, and our friends and allies in that region, as our guide in terms of their judgments on whether we have a critical mass for a credible political process that will get us to the desired political end-state, which is a change in Syria—because with the continuation of the Assad regime in an open-ended fashion, we are not going to get to a stable situation.